At the center of Naotaka Hiro’s artistic practice is an exploration of his own body. His paintings have taken the form of canvas tubes or sheets that wrap around his body as he creates them, at times being cut into and altered as the artist struggles against the material. Likewise, his daily drawing practice shows a direct connection to the artist’s body; these works on paper are made on 42 x 32 inch sheets that are approximately half the size of the artist’s body. 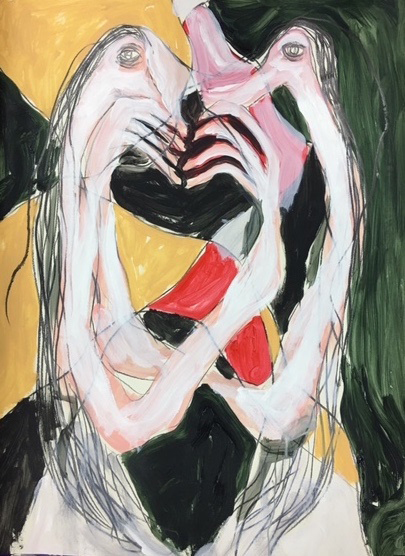 Distorted figures with oddly formed hair, eyes, and limbs explore each other, suggesting a newly conscious creature trying to understand its existence. Hiro’s sculptures, drawings, and paintings exist as a truly unique universe where the human body is both a real, sensing being, yet a creature full of questions, poetic possibility, and metaphorical images. Hiro’s work has been included in exhibitions in the US and Japan. He was recently included in the Hammer biennial exhibition Made in L.A. 2018.